The Alborz Mountains north of Teheran with their highest peak Mt. Damavand are still a true secret spot for backcountry skiers. The firn slopes of the Daborrar Mountains and Alam Kuh are never tracked and provide ideal terrain for acclimatization. Iran offers a unique cultural experience virtually untouched by mass tourism. The ancient cities of Pasargadae and Persepolis preserve king Xerxes’ heritage, while Isfahan, Shiraz and Kashan boast the most beautiful mosques and palaces dating from various Islamic periods. In order to increase the probability of reaching the peak of Mt. Damavand, my tour dates are two weeks later than those of most other operators. Between the end of April and the beginning of May, the conditions are usually best. At the beginning of April, there are often strong winds at 5.000 m, the avalanche danger is still much too high and the temperatures too low. Despite of careful planning it may be necessary though to climb the last few vertical meters with our skis attached to our backpacks. Participants must be fit enough to hike 4 to 6 hours daily with vertical gains of up to 1600. Sure-footedness, solid backcountry skiing technique, including kick turns for the ascent, are a must. A relatively heavy backpack with sleeping bag, sleeping mat and food for 24 hours must be carried to the bivouac of Mt. Damavand at 4.200m. The Alborz range north of Teheran with Mt. 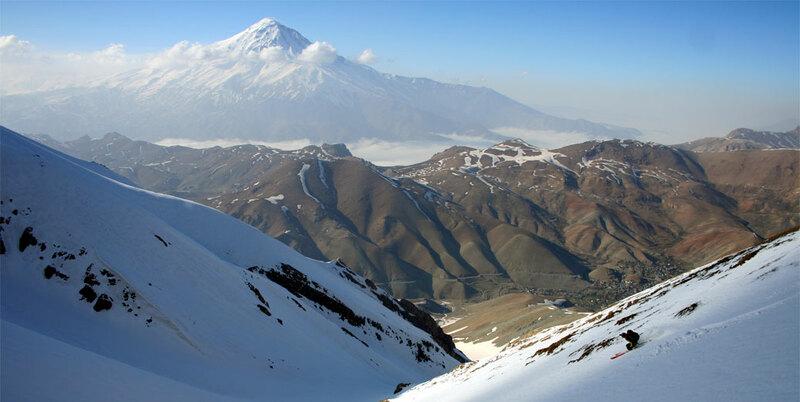 Damavand (5.671 m) as its highest peak is still an insider tip for ski mountaineers. Even proficient alpinists must ensure good acclimatization at these elevations. Depending on snow and weather conditions we will acclimatize either in the Daborrar Mountains or at Alam Kuh. In the Daborrar area we stay with locals, the acclimatization zone is at 4.100 m. With an elevation of 4.848 m, Alam Kuh offers better acclimatization at the price of spending two nights in tents. I recommend one or the other ski tour to a minimum elevation of 3.500 m during the last two weeks prior to departure. The acclimatization gained in these tours will remain effective for up to three weeks. Local transport: airport pick-up, transfer to ski tour starting points, tour bus during cultural programme. Personal assistance: during the entire journey. Sightseeing guide: local guide (English or German speaking) on 5 days. Accommodation: 1 night at a hotel in Teherean, 5 nights of simple accommodation with local families, 1 night at the Damavand bivouac. In the case of acclimatization on Alam Kuh, two nights in a tent. Teheran, Kashan, Isfahan and Shiraz – 5 nights hotel accommodation. Food: Half board during ski tours. During the city trips, only breakfast is included. Maximum group size 8 persons with two officially licensed ski- and mountain guides.